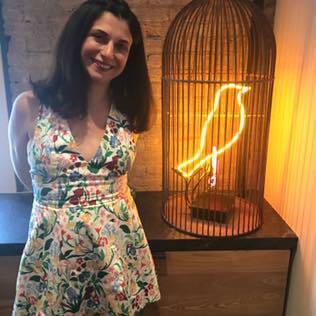 A few weeks ago, while my husband watched his beloved college football, I took both girls to Harvest Moon. Whoa. I did not realize how daunting of a task that would be. 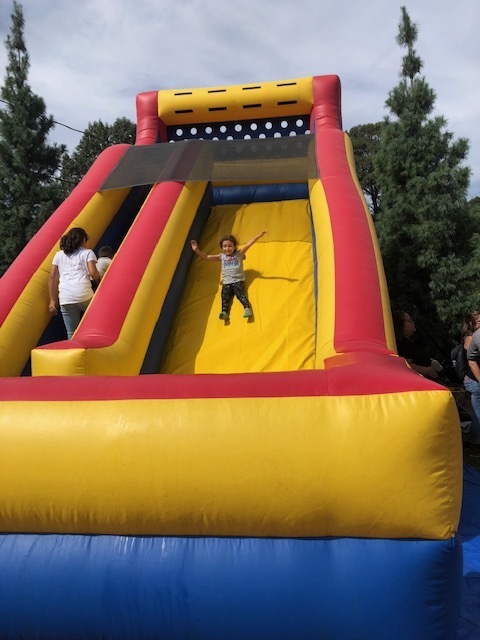 Harvest Moon does a Fall Festival every weekend from September 8th through October 28th as well as certain weekday holidays. We happened to be there on what was both the first official day of fall and a gorgeous Saturday afternoon, so it was PACKED. My girls’ eyes immediately lit up at the sight of multiple bouncy castles and a bungee trampoline section in the distance as we pulled up. There are attendants helping direct cars where to park and there’s a ton of parking space in the lots. 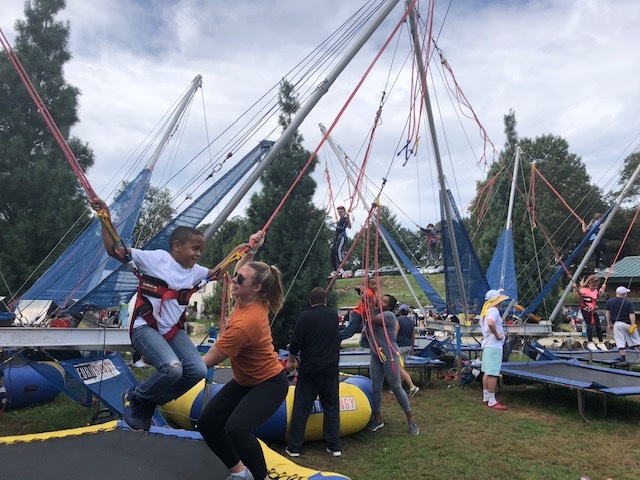 We quickly got our bearings and headed over to said bouncy castles. $12 later, the girls were bouncing away (there’s a small bouncy house for ages 5 and under and then two bouncy slides for any age kids). 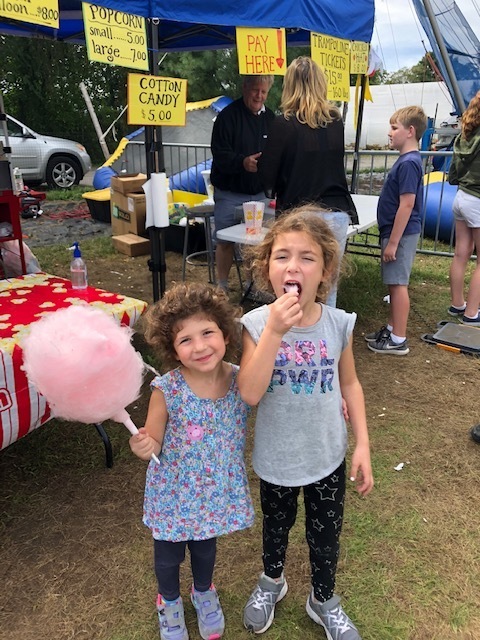 I then managed to avoid the bungee experience, blaming it on the long line and instead allowed the girls to split a pink cotton candy. After breezing through the pumpkin patch and past the live music, we teetered over to the face painting section (another $6/kid for a small paint job) to get a unicorn (little one) and monkey (big kid). We walked around a bit more, I ran into roughly 20 people I knew from college etc. and finally, after sidestepping the pony ride area, we walked up into the orchard to pick apples. 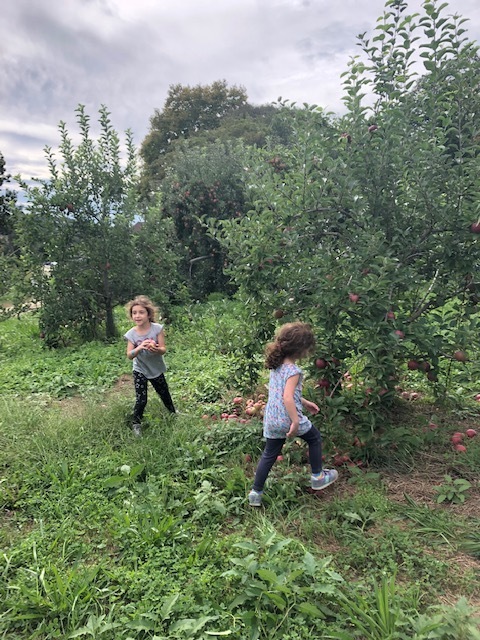 Harvest Moon only offers apples by the $30 large bag, which was a bummer for my non-apple obsessed family and my tired arms, but we had a blast picking together. 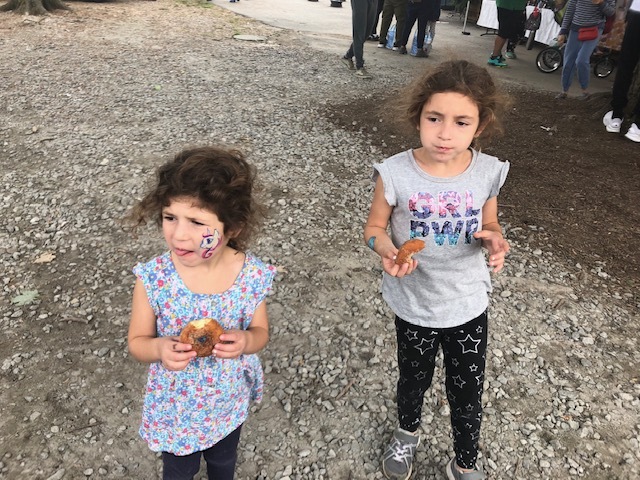 We had already eaten before our visit but Harvest Moon offers a ton in the way of food and drink options (no outside food allowed) and we did enjoy our one purchase of the fresh cider doughnuts. For adults, especially those who dread this kind of stuff, don’t miss Harvest Moon’s cute Cider Shed that, at least on my visit, also had Captain Lawrence Kolsch. I saw lots of adults walking around enjoying cider and beer. 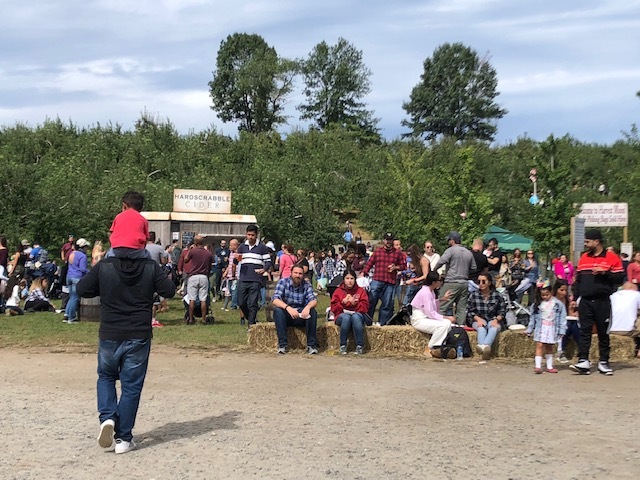 On a whole, we had a great time at Harvest Moon, but if you go, do go armed with lots of cash (no credit cards accepted outside but there are ATMs on site) and a lot of patience to deal with crowds and lines. The grounds are pretty big at Harvest Moon so you won’t feel claustrophobic but there will be lines for each activity, unless you arrive right when the farm opens. Oddly, Outhouse Orchards is right next door and I think it’s fairly common to hit both while you’re in the area. 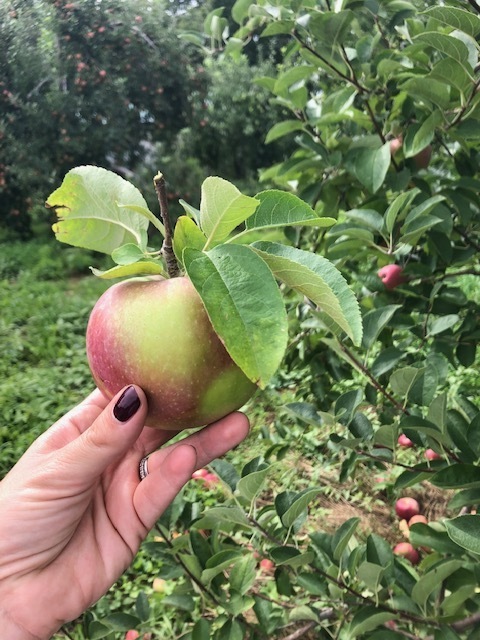 It took us about 35 minutes to get to Harvest Moon from our house in Greenwich but for those near Interstate 684, the farm is conveniently located just minutes from Exit 8 on that highway. If you’re going to head out to the North Fork in the fall, get a VERY early start. Just like the Hamptons in summer, the North Fork is insanely crowded once the leaves start to change. 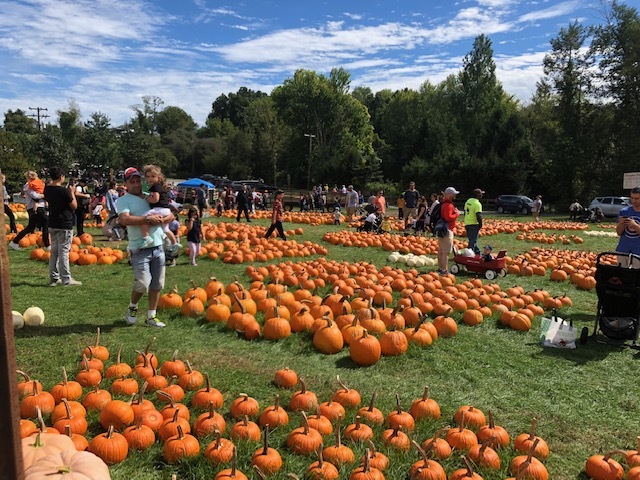 We luckily did get such an early start last weekend when we met my Long Island family at the Harbes Jamesport location for some pumpkin picking fun. This Harbes location is far smaller than what must be the “hub” Mattituck location. When we arrived at 10am for opening, the place was empty and still getting set up. We quickly ordered some cider donuts (obviously) and made our way over to the pumpkin patch. One nice thing about this farm is that pumpkin picking is on the vine. Certain family members were not happy about this fact, believing it to mean less perfect looking pumpkins but I had fun searching around the vines and pulling some guys off by their stem. We grabbed a wagon and grabbed a few pumpkins - my husband HAD to assess each of my picks - and gourds just as the sun started heating up. 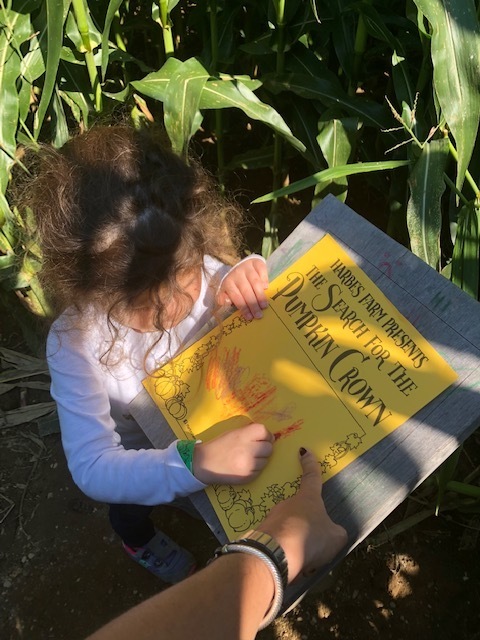 The Jamesport farm is home to “Pumpkinland”, which, besides the U-pick pumpkin patch, means a small pumpkin themed play area, a SUPER cool pumpkin shaped bounce house, a hayride and the interactive corn maze. 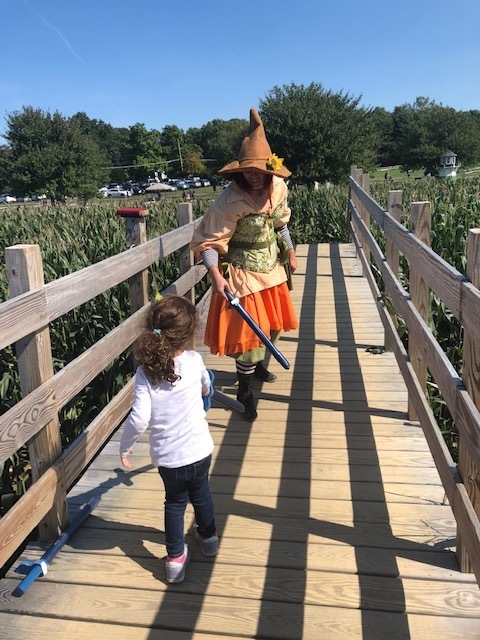 For a small fee, guests can visit a cute, family friendly 1.5 acre corn maze that includes a few interactive activities (spoiler alert: there’s a sword fight!) with Harbes actors. The kids in our group had fun not only finding their way through the maze but trying to find the clues that lead guests to the next interactive activity. By now we were starving and hot so our plan was to hit Jamesport Farm Brewery for lunch and refreshments. Unfortunately for our car, we took a wrong turn and what should have been a short drive turned into a ONE HOUR drive due to traffic coming from Mr. Harbes’ Orchard on the same road as the brewery. 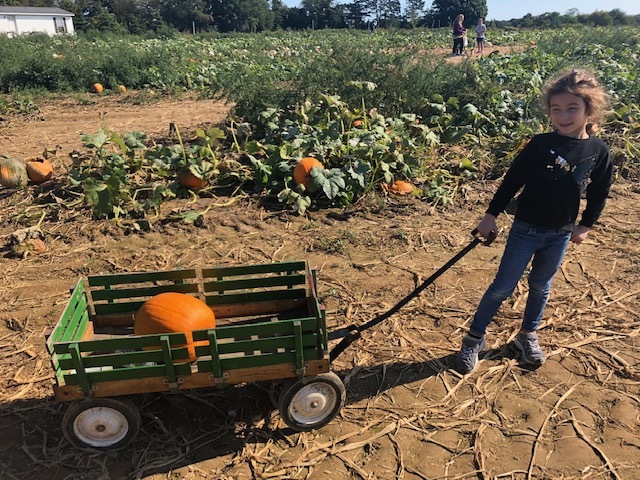 And, as if that isn’t enough, the Harbes hub at Mattituck is also killing it in the fall with its own pumpkin picking, vineyard offerings and the Barnyard Adventure that we took our girls to this summer. Yes, the Harbes Family does very well. Back to Jamesport Farm Brewery. They have a huge outdoor space for relaxing and drinking and running around (if you’re a little one who enjoys that kind of stuff). On our Saturday afternoon visit, there was also live music and a Thomas the Train ride that was taking kids around the property. We had a really nice time spending a few hours outside there and boy was I happy to see my beer after an hour of traffic. The unaffiliated food truck that was there during our visit was really bad, so consider eating beforehand at the new Little Lucharitos outpost near the Jamesport Harbes before you head to the brewery. Both visits were great (albeit hectic) for a family with young kids. Next up, I want to try Fishkill Farms - an all organic farm in Dutchess County that will likely be less amusement park and more food focused.